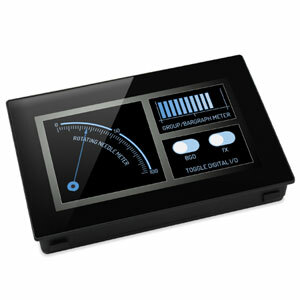 The OM-SGD-43-A is a 4.3" capacitive touchscreen display designed for use with the Design Studio software, a free drag-and-drop style software package for rapid development of advanced user interfaces and panel meters. The Design Studio software allows the user to create of anything from simple meters and dials, through to advanced user interfaces with control elements. The OM-SGD-43-A can be powered from the USB port of a computer or from an external 5 to 30 V supply. The Design Studio software provides a number of building blocks which allow users to drag-and-drop elements onto the screen to quickly create advanced user interfaces. From background images to text elements, analog style meters, touchscreen navigation elements and even complex logic statements. Users can build-up multi-screen interfaces without needing to write a line of code. There is a library of pre-defined elements such as meters, buttons and switches. Users can create their own content by combining elements or importing graphics in a number of formats (including jpg, png, tif, bmp and gif). The software includes support for transparency and multiple layers. Hardware interfacing is similarly intuitive, with hardware elements being dragged into a function builder where associations with graphical elements (such as a needle on a meter) can be defined. Here users can determine scaling for analog inputs, define alarm triggers, behaviors for digital inputs and outputs and configure PWM outputs. The software includes a ‘Preview in Emulator’ function which emulates the hardware’s inputs and outputs, allowing users to test their projects prior to upload. Projects are uploaded to the OM-SGD-43-A via a mini USB port. The Design Studio software is compatible with Windows® XP (SP3), Vista, 7 and 8 and can be downloaded free online at OMEGA. The OM-SGD-43-A-PLUS is a development kit that include the OM-SGD-43-A display, a USB cable and a development board which provides connections to all of the input/output functionality of the display. This includes LEDs and switches for digital I/O’s, four potentiometers to generate analog inputs, variable brightness LED’s for PWM outputs and a prototyping area for testing circuitry. Connections are also available for the display’s RS232, SPI and I2C functionality which will be made available for use in a future software update. The development board can be powered directly by connecting the USB cable to the back of the display that is plugged into it (USB interface provides power to both the display as well as the development board). Nota: Comes complete with quick start manual, panel mount bracket and 45 cm USB cable. OM-SGD-43-A-DK-PLUS includes all of the above plus development board with standoffs.